Learn ESL and EL Civics with Pictures! 1. Sacajawea was the daughter of a Shoshone chief and was born around 1788. 2. When she was about 12 or 13, the Shoshones were attacked by the Hidatsa Indians and Sacajawea was captured and sold to a French-Canadian trapper who made her one of his wives. 3. William Clark liked her son and nicknamed him "Pomp" or "Pompey" which means first born. 4. When her son was about five, he was put under Clark's care to be raised and educated. 5. Sometime after Sacajawea's death, Clark also got custody of her daughter, Lissette. He raised both of the children. Sacajawea was a young Shoshone woman who helped Meriwether Lewis and William Clark on their trip to the Pacific Ocean. Their trip was called the Corps of Discovery. President Thomas Jefferson wanted the Corps of Discovery to explore the Missouri River and other rivers in the area to find the most direct route to the Pacific Ocean. Sacajawea was about 16 years old when she and her husband, a French-Canadian trapper named Toussaint Charbonneau, joined the group of explorers. Sacajawea was pregnant at the time with her first child. During the trip, she gave birth to a son named Jean Baptiste Charbonneau. When the Corps of Discovery encountered Shoshone Indians, Sacajawea discovered that their leader was her brother. Lewis and Clark purchased horses from the Shoshones. They used the horses to cross the Rocky Mountains. The expedition reached the Pacific Ocean in November of 1805. In March, the group started the journey back east. Historians don't know much about Sacajewea's life after she and her husband left the group. It is believed that Sacajawea died a few months after the birth of her second child in 1812. 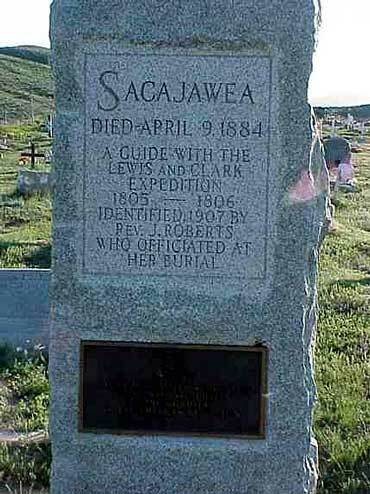 Sacajawea contributed to the success of the Lewis and Clark Expedition by serving as an interpreter, finding edible plants, and saving important documents and supplies when a boat capsized. Copyrights to the pictures and photos on this ESL and EL Civics website belong to individual photographers. We have purchased the rights to use them. Do not copy the photos on this site. Permission is granted to copy any of the worksheets for classroom use. Permission is granted to link to any page of this website. Contact Christina Niven, Web Developer, at christina@elcivics.com. Please send corrections, comments, greetings, and requests for new photo tours, lessons, and civics units. Copyright © Christina Niven, 2007.